I feel rather guilty, because I'm finally about to review this product after more than a year of having it. My makeup fairy godmother gave this to me, and it has been one of my favorite on-the-go products. 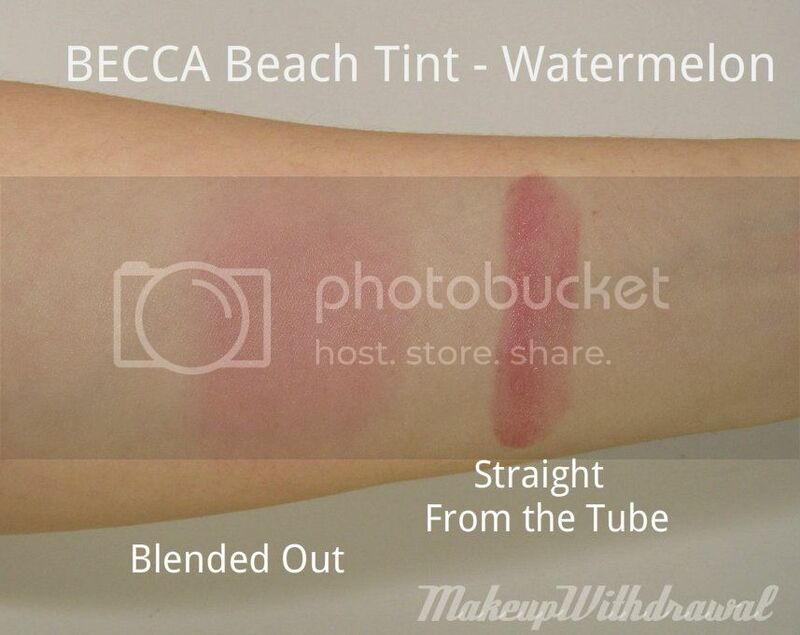 BECCA Beach Tint in Watermelon is a little tube of lip and cheek tint. It is slick in texture and is a very gorgeous, juicy pink- the shade is very aptly named. I love that the color can really be built up- a touch on the cheeks for a beautiful glow or a bit more on the lips for a healthy, natural dark pink. It wears really well on top of both bare skin or foundation/BB Cream/tinted moisturizer. I wear this constantly with warm weather because when the days get humid and hot, the Beach Tint really doesn't go anywhere on my cheeks. Also, I can get quite lazy with makeup when it is hot out and I'm a huge fan of two in one products. The small size makes it very convenient to stash in my purse for touch ups later on. On my lips, this usually lasts quite a while but may require a dab to refresh the color if I've eaten a lot of oily foods (or done a lot of kissing!). The only down side to this product is that it can separate in the tube. Be sure to squish the tube around before using it, or else you can get an oily fluid. This tube contains 7ml./0.24 fl. oz which you might think is mighty tiny, but rest assured that a little goes a long way. I've used this an awful lot over the last year and I have plenty left, more than 3/4 in the tube to go. Eyes: LORAC Behind the Scenes Eye Primer, Coastal Scents Hot Pot in Dark Golden Olive, Stars Makeup Haven Carnal Knowledge shadow, Rock & Republic Fatalistic shadow and false lashes. 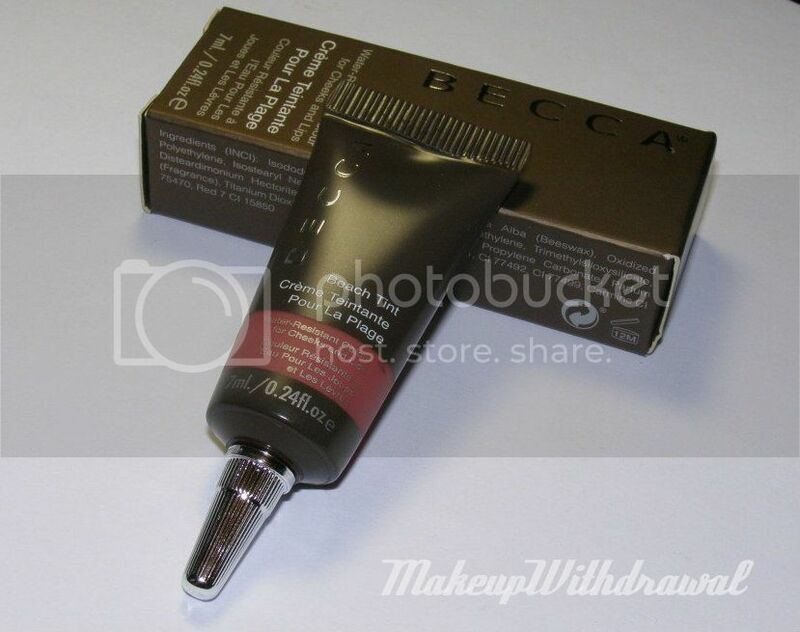 BECCA Beach Tints are $25 each and can be found on Dermstore and Zuneta, online. I have my eye on Strawberry next! Check out my friend Lynn's blog, Shades of BECCA for additional swatches. She has a mighty impressive selection of BECCA products. Have you tried any BECCA Beach Tints? Product featured was given to me as a present by a very amazing individual. For additional information, please refer to my Disclosure Policy.